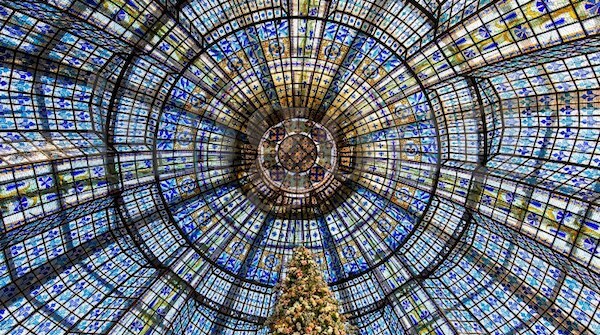 Your tour will begin at the first covered passage, the Galerie Véro-Dodat, lined with its original gas lamp fixtures and Christmas lights to put you in a festive Holiday spirit. Next visit the historic Palais Royal, a breath-taking 17th century palace with extensive gardens and wander through the elegant archways which will be illuminated with Christmas trees and twinkling lights. 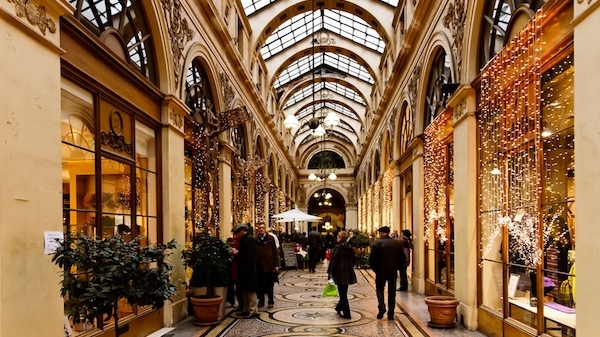 You will continue through additional covered passages, the Galerie Vivienne and the Passage Choiseul, where you can visit Marie-Antoinette’s favorite chocolate shop. Stop by this historic candy store and purchase some of her elected sweet treats for a unique Holiday gift. Continue on to the Passage des Panoramas lined with shops, ethnic eateries and bistrots, along with plenty of festive decorations. Then proceed into Passage Jouffroy known for its unique window displays, its tea room, and the Hotel Chopin where the composer spent much of his time. The final passage will be the elegant Passage des Princes, which is a great place to find a special Christmas gift for any child at one of the many toy shops. 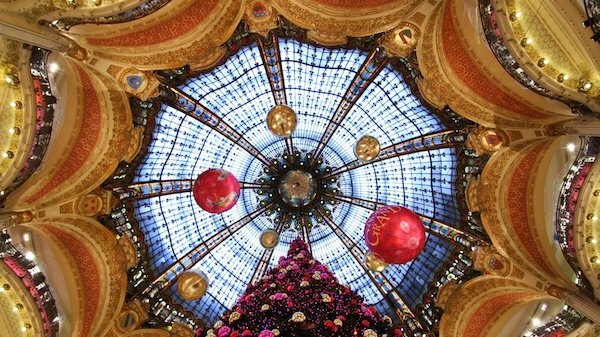 Your guided tour will end in front of the iconic Galeries Lafayette store, where you will be mesmerized by their famed Christmas window displays. If you would like to fit in a visit to the legendary Opéra Garnier, you can combine a self-guided visit with this covered passage tour. For an extra fee, your guide can provide you with a skip-the-line ticket to explore this beautiful building on your own afterwards. Please just let our Travel Design Team know in advance and they will be pleased to make the arrangements for you. The total walking distance covered is 1.8 miles.